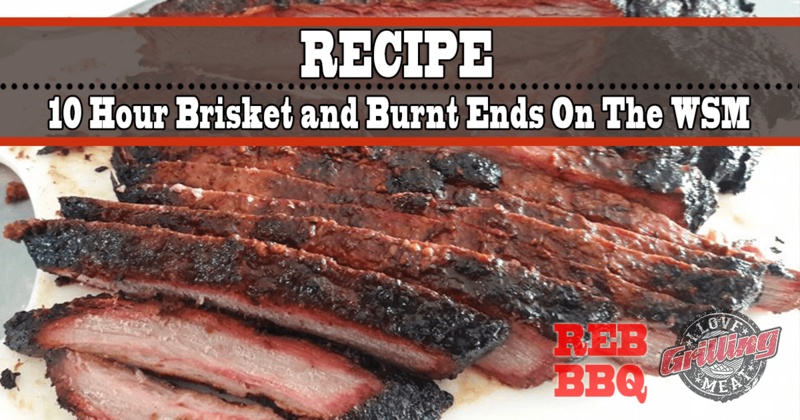 This is a strictly Texas-style way to cook brisket and burnt ends that will absolutely knock your barbecue socks off. Plus, you’ll also find some high level tips for smoking large cuts of meat on a smaller size smoker such as the Mini WSM. First things first: Before doing anything else, get a sharp knife and trim down the fat. Any hard fat that won’t render down during cooking should be removed completely, while soft fat should be around ¼ of an inch to ensure it can be penetrated by the smoke. Next, since this is a guide on how to smoke brisket on the Mini WSM, go ahead and separate the point from the flat. The diameter of the mini WSM is 14.5 inches (your mini smoker may be different), but it’s ok to have a longer cut since the meat will shrink down during cooking. Set your smoker up for cooking in the 225ºF-250ºF range. Place a roasting pan at the bottom of your pit to collect all of the juices that will come out of the meat. Yum! Place the point on the bottom grates and the flat on top. Use a meat thermometer probe to monitor temperature in the thickest parts of both the flat and point. Following the Texas Crutch method, wrap both flat and point as soon as you reach the stall (when internal temperature stops rising around 160ºF). Place back on the smoker and keep cooking. Once core temperature hits 196ºF, it’s time to pull them off the heat! Let the meat rest and reabsorb its juices- in the meantime, collect the juices from the roasting pan and reduce to sauce consistency. To make your burnt ends, slice the flat into 1 inch cubes. Place them in a roasting pan and pour in the reduced juices, 2-3 Tbsp of your favorite beef rub and some BBQ sauce. Mix well. Enjoy your brisket and burnt ends!